Suggesting the ‘perfect’ coffee for a latte is really impossible, as it all comes down to personal taste. 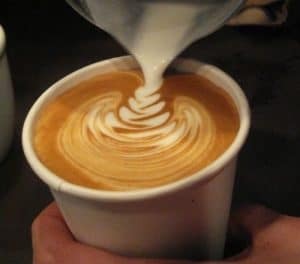 While the base of your drink is espresso, the important thing to remember is that we’re making a latte, so if you want to taste the coffee rather than the milk, you’ll want a robust medium/dark roast coffee (look for words like ‘chocolate’, ‘caramel’ or ‘burnt sugar’ on the label, rather than floral and fruity descriptions). Extra tip: If you have the choice, go for whole beans rather than pre-ground. If you have a capsule espresso machine, you can skip this part. However, for everyone else, it’s important to remember that whether you buy pre-ground beans, or grind them yourself (with a manual, standalone or built-in grinder), you’ll want a fine grind size for espresso. Every grinder is different, so there’s no standard setting. Experiment and you’ll find small changes make a difference to the result. Extra tip: No espresso machine? Try coffee brewed using an Aeropress or other strongly brewed coffee to make your latte – it won’t be exactly the same as espresso but can be a passable substitute. Now we’re ready for the crucial work of producing a quality espresso base for your latte. If you have a capsule or fully automatic espresso machine, this could be as easy as pressing a button! However, if you have a manual-type machine, again, there’s some work involved. Firstly, you’ll need to put your coffee into the grouphead. Aim for around 7 to 9g of coffee for a single shot and 14 to 18g for a double shot. You then need to tamp it down. This requires a single, firm and even motion to flatten the coffee. Wipe any grounds off the top of the grouphead and flush a little water through the espresso machine. Then lock in the grouphead and start the extraction process – ideally you’re aiming for the extraction to take 30 seconds. The resulting shot should have a nice layer of crema on the top. In all honesty, when making a latte (or other beverage containing lots of milk) the preciseness of the shot is not as important as when enjoying a drink that’s mostly coffee (such as an Americano, espresso, lungo or macchiato). If the extraction takes in the range of 25 to 35 seconds, you’re unlikely to notice a real difference in the finished drink. Extra tip: Coordinate the process of making your latte by setting up the shot to extract while you’re steaming the milk. Whole, 2%, 1%, skinny, almond…there are lots of different options when it comes to milk. Going purely on taste and texture alone, the best option is whole milk. However, if you’d rather make a skinny latte, skim (or other type of lower fat milk) is fine too. You’ll find its texture when steamed is a little different, though. Using non-dairy alternatives is a bit trickier as they don’t always stand up well to steaming (due to the protein content). You might also find your non-dairy milk curdles or separates when added to the hot coffee (due to the acidity). Other issues to consider include the taste of the milk, which can overwhelm the coffee. If you want/need to go dairy-free, the best advice is to try a few different alternatives to see which you like best. The obvious choice is soy, but you could also try oat milk which has the high protein content needed for streaming and has a subtler taste. Extra tip: In some high-end coffee shops, the almond milk latte is becoming fashionable when paired with a coffee that has flavors of nuts/chocolate. Almond milk is very low in protein so doesn’t stand up as well to steaming, but you might like to give it a try. Once you’ve chosen the milk you’d like to use, the next step is to steam it to create the nice silky texture you get in coffee shops. The proportion of milk to espresso in a standard size coffee shop latte is 8oz milk to a single or double shot of espresso. However, the great advantage of being a home barista is that you’re not tied to set ratios of milk to espresso. You can experiment until you find the right proportion for you. Your espresso shot should be a uniform single or double. To alter the strength of your latte, add or reduce the number of shots or vary the amount of milk (rather than altering the amount of ground coffee in the shot). How you steam your milk for your latte depends on your milk wand/foamer. If you have a handheld device or a piece of equipment like Nespresso Aeroccino, all the hard work is done for you. Likewise, if you have an automatic espresso machine, the process of steaming the milk might be as easy as inserting the wand into your pitcher of milk and pressing a button. If you don’t get the required silky texture, it may be because you’ve overheated the milk (170 degrees or more will burn it!) or not turned up the steam to a sufficiently high pressure. It’s important not to store steamed milk, add cold milk to streamed milk or put steamed milk into the fridge. Steam a fresh milk pitcher for each beverage you make. Extra tip: To make an 8oz latte, make sure you have a milk pitcher with at least 12oz capacity – the milk will expand and froth up when heated, creating a real risk of overflowing! We’re getting close to drinking time! The final stage is to pour the steamed milk into the hot espresso. There is a question over whether it should be espresso over milk or vice versa. However, watch profession baristas in action and you’ll see it’s usually steamed milk into espresso. Try it the other way and see if it makes a difference! Hold the cup at a slight angle and pour the milk slowly to ensure it combines with the espresso. 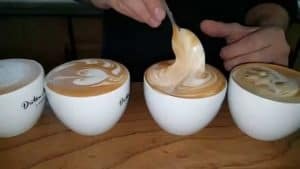 Keep pouring at an angle until the cup is nearly full then slowly bring the cup level to finish the pour with a layer of thick milk foam on top. Technically, a latte has a far smaller layer of foam than a cappuccino, but, again, the beauty of being a home barista is that you get to make your drink in your way! For an extra professional touch, use a cup that’s been pre-warmed. 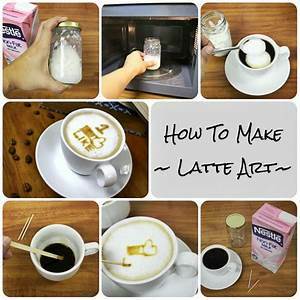 Extra tip: If you want to add a flavored syrup to your latte, whisk it into the hot espresso before adding the milk. Of course, this stage is totally optional but fun to try (and really not as hard as it looks!) There are courses you can take and lots of free resources available on the web to help. So, there you have it! Practice these stages and you’ll soon be on your way to becoming a skilled home latte whizz. You can then move on to really impressing your friends by mastering cappuccinos, macchiatos and cortados . Who knows, maybe it’ll even be the start of a whole new career as a professional barista! Previous Post: « Does the Breville Barista Express Live Up to the Buzz?